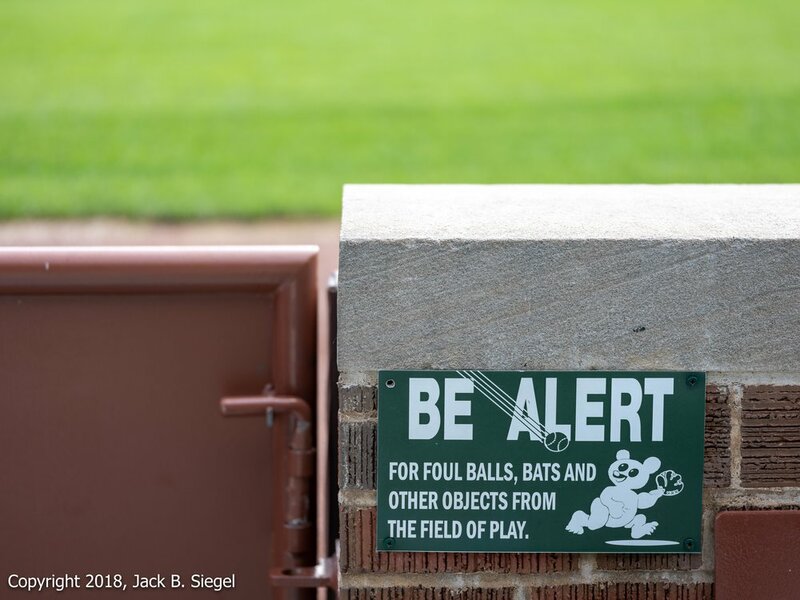 Today, I took a photographic tour of famed Wrigley Field. One thing is for sure: the Ricketts family has sunk a ton of money into the stadium and the surrounding neighborhood. As a structure, the stadium looks great. It is now very well maintained. I suspect fans don’t have to worry anymore about bits of concrete falling into the stands. As an iconic sports stadium, Wrigley fails. I realize the owners need to make money, but their needs are in my face. Every inch of the facility is designed to generate revenue. There is corporate signage all over the place, and I suspect more is coming. The two new Jumbotrons were off during my visit, but during the game they spew endless advertising and promotions. For many, a visit to Wrigley is a check-the-box event. “Go Cubbies,” but most of these folks are not baseball fans. Apparently the screens in their pocket are not enough to distract them from the play on the field, so the Cubs added two large screens to further distract. As for the neighborhood, the Rickets have built a largely nondescript mixed use facility along Addison. It includes apartments, retail space, and I suspect a few bars or restaurants. I admire the two or three small buildings on the corner of Addison and Clark. They presumably held out, but I did notice the auto repair shop has a sign on the door saying it is moving. Across from Wrigley on Clark sits the Zachery Hotel. It replaced the McDonalds and a souvenier stand. The structure has received good reviews in terms of its architectural merits, but it crowds Wrigley and brings a corporate mentality to the area. Most of the old dive bars and ticket sellers on Clark Street are gone, replaced by Yuppie bars and restaurants. The neighborhood is losing its charm. More corporate drinking and eating spots are on their way, as the boarded-up storefronts portend. 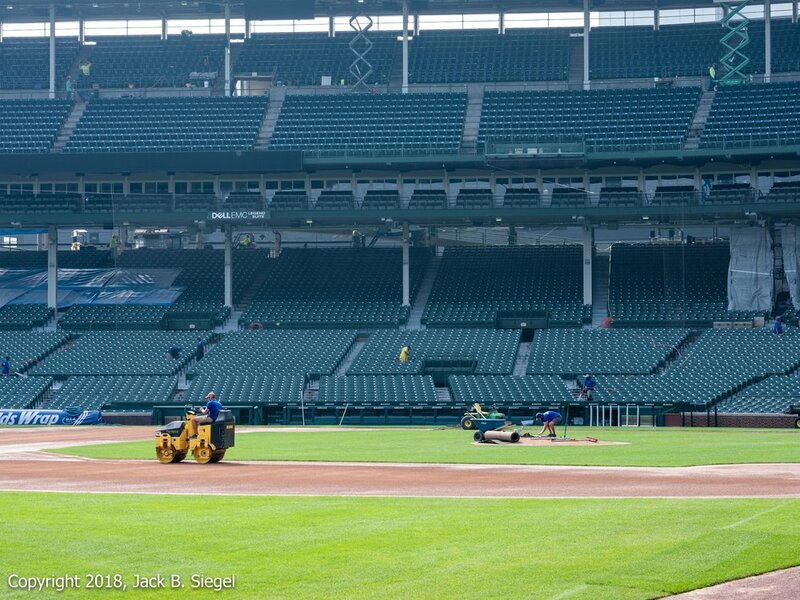 I have often wondered what it would be like to photograph Wrigley without people. I have to say, photographically it is the people in the seats who make the park, not the seats themselves. Despite my rather negative observations, it was an interesting and fun experience. I heard the tale of the Billy Goat (again), learned that there is no hurry to remodel the visiting team’s locker room, and sat in the press box. And maybe it is a good thing that the Cubs have been slow to remodel the visiting team’s locker room. The likes of Hank Aaron, Jackie Robinson, Lou Gehrig, Michael Jordan, Elton John, and Billy Joel have all used it. It may be a dump, but it has the old ballpark ambience that so many still long for. Photographer’s Notes: There were certainly many more opportunities, but this was a 90-minute tour, with two minders who kept a short leash on me, moving from one location to another. It is difficult to create under those circumstances. Good photography requires time and thought, just like good baseball.